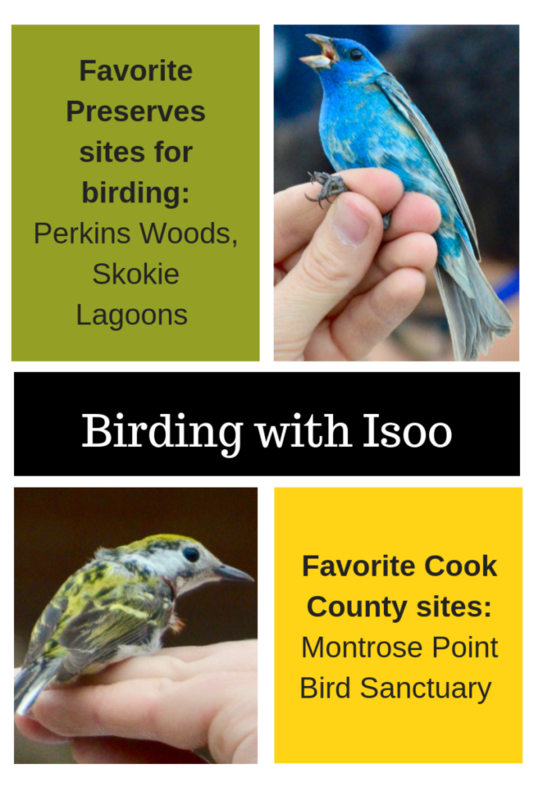 Isoo O’Brien may be Cook County’s youngest birding expert. The 15 year old has led walks for the Evanston North Shore Bird Club and through the Chicago Botanic Garden. 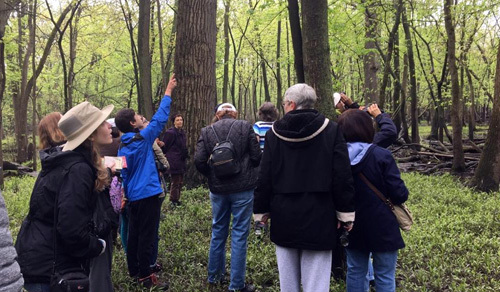 In May, he led walks in LaBagh Woods, part of the Forest Preserves of Cook County, for the International Migratory Bird Celebration Day. That’s where Foundation President Shelley Davis first saw him in action. Isoo leading a bird walk in LaBagh Woods. 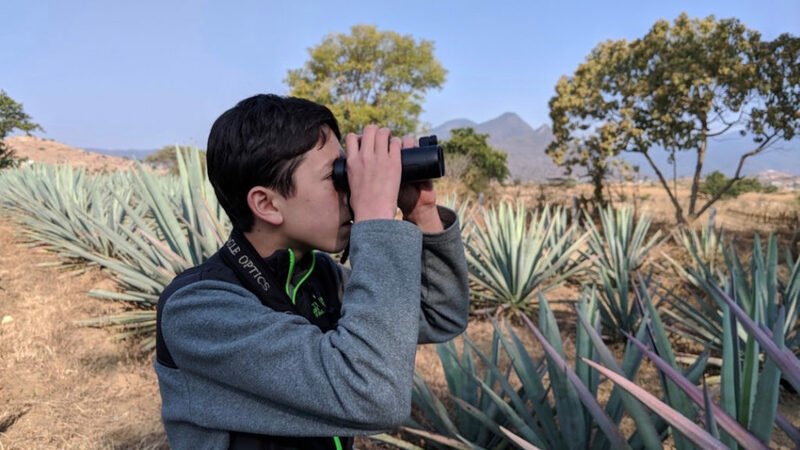 A high school sophomore, Isoo started birding when he was 9, going on trips with his grandparents, who are avid birders. Initially, they lent him their binoculars. Seeing his enthusiasm, they bought him his own binoculars. Then Isoo got a field guide to really sharpen his bird identification. 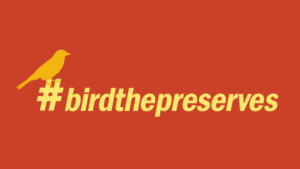 That’s when his birding took off. “I became really obsessed and got into the whole birding thing,” Isoo explains. During the height of the spring migration season, you’ll find Isoo birding about five times a week. “I’ll hit up a local spot near my house maybe an hour before school or an hour after school,” he says. While Isoo has gone birding in Mexico and California, his favorite spot is a preserve in Evanston called Perkins Woods. It’s a tiny woodland area but “a spring migrant hotspot,” according to the Forest Preserves website. When birding, Isoo carries binoculars and a camera. He dresses in muted colors so that he doesn’t draw attention to himself. “If you stand out, you’re more likely to scare the birds,” he says. Isoo talks about birds with an expertise and savvy that seems far beyond his years. He confidently discusses bird habitats, migration patterns —and how changes in climate are affecting their nesting grounds. As weather patterns change, he has seen some birds moving northward, he says. Sounding more like a professor of ornithology than a 10th-grader, Isoo continues. You can be sure Isoo was one of them. He’s also among the most active members of a group called Illinois Young Birders. He also has taken on the Big Year, a personal challenge among birders to identify as many species in a specific boundary within a year, he explains. “I’ve been chasing all the ones I can get to. Anytime there’s a rare bird I can get to, I’ll find a way there, with a friend or by train or my dad taking me or riding my bike,” says Isoo, who isn’t old enough yet to drive. We have no doubt he will.